Our article on the recently refiled Physician Assisted Suicide bill in the Maryland General Assembly has evoked many of the same arguments we have shared over the past years on this topic. As the proponents have made no effort to address the concerns of the opposition and, by reading the comments on the article by some readers, it is worth sharing again more information about why we are so strongly against this legislation and urge all our readers to continue their opposition to it as well. 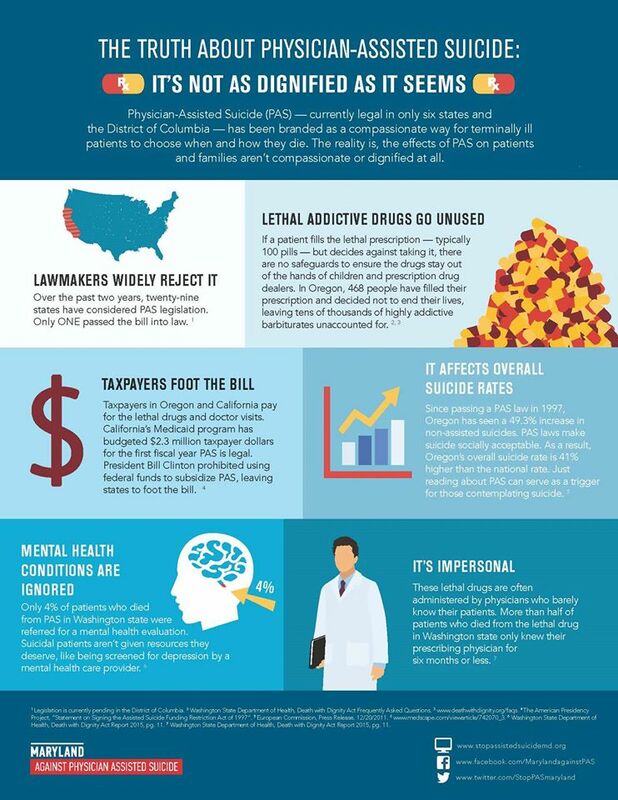 And for those who do oppose Physician Assisted Suicide, here is some information you can share to help make the argument. 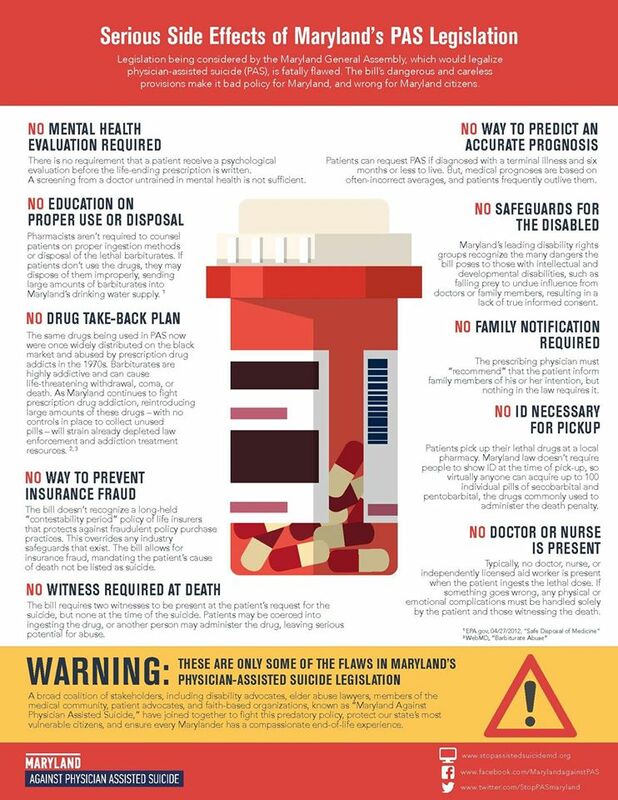 Here are some infographics provided by our friends at Maryland Against Physician Assisted Suicide detailing the problems with this legislation. Please copy and share them on your social media accounts. Let’s review the details of the problems we have documented here at Red Maryland. First, you must listen to our 2017 interview with Dr. Joseph Marine of Johns Hopkins Hospital who detailed many of the serious concerns the medical community has about this legislation. One of the most serious concerns about this legislation has been the dishonest way it has been presented. Supporters make the absurd claim that what the legislation permits is not even suicide. The legislation requires doctor’s to essentially lie about the cause of death on the death certificate. This is done not only to obfuscate the reality of this legislation being about suicide but to prevent any effective oversight of the PAS regime once implemented. We have noted the reports of the Des Moines Register and others in analyzing the effects of physician assisted suicide where it has been implemented. The opposition of medical groups like the American Medical Association has been affirmed repeatedly. In this case, the woman, who was suffering from dementia, had earlier expressed a desire to have her life ended when she felt the “time was right”. According to case notes, the woman, who lived in a nursing home, showed signs of fear and anger. She would also wander around the premises at night. The end came when a doctor put a soporific into her coffee before administering a lethal injection. But as the doctor tried to administer the injection, she began to struggle and the doctor had to seek the family’s help to complete the procedure. The only way to prevent these types of horror stories from happening in Maryland is to avoid going down this road in the first place. One of the glaring weaknesses about this legislation that has never been corrected is the possibility of abuse. 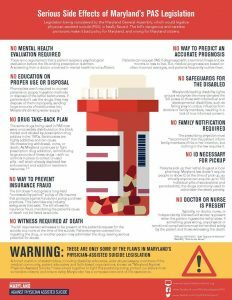 The bill envisions that a doctor will prescribe a lethal dose of medication that the patient will pick up and take themselves as they commit suicide. But the bill does not provide any oversight in this process. There is no requirement that the patient pick up the prescription themselves. There is no medical oversight or requirement that any medical professional or even any objective third party be present to observe the ingestion of the lethal dose of barbiturates. Nothing prevents a family member, caretaker or other from administering the lethal drugs. The potential for abuse is obvious. Even without the spectre of force, the abuse permitted by this legislation is terrifying. As Dr. Marine confirmed, the number one reason people seek physician assisted suicide is that they feel that they are a burden to others. Heirs and family members may have a financial interest in seeing the patient end their life rather than continue in expensive medical care and may exert undue influence on the patient. Nothing in the legislation addresses this or builds in any protection for vulnerable patients who may be affected in this way. In Maryland, the Court of Appeals has identified seven elements to be considered when determining whether undue influence exists in the context of a will. In the proposed bill, however, these same factors reflect clearly permissible behavior. Undue influence, as that term is traditionally defined, is legalized by the proposed bill. But the sad reality is that any time another human being feels that they are better off dead and chooses to kill themselves, we have failed them as a society. Promotion physician assisted suicide as a “rational” act by someone facing a terminal disease only confirms that their life does have less value and is not worthy of the protections we give to healthy people or those who are expected to live more than six months. It is abuse of vulnerable often despairing people plain and simple. Proponents of Physician Assisted Suicide contend that is a private issue and if you do not approve you will not be affected. It simply isn’t true. Taxpayers in Oregon and California pay for the lethal drugs and doctor visits. 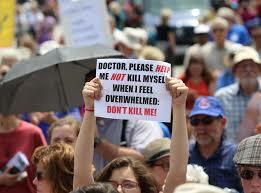 California has budgeted $2.3 million taxpayer dollars for the first year Physician Assisted Suicide is legal. President Clinton even prohibited using federal funds to subsidize Physician Assisted Suicide, leaving the states to legalize this practice to foot the bill. In other words, if passed, Marylanders will be paying their tax dollars to fund the suicides of their neighbors. Similar bills in other states are calculated to lead to a one third increase in the suicide rate. Supporters cannot reconcile the fact that the nation faces a crisis in suicide and a lack of suicide prevention at the same time that bills such as this, especially with the championing of the idea of “autonomy”, promote suicide generally. Suicide is already the 10th leading cause of death in America with more suicides every year than homicides. 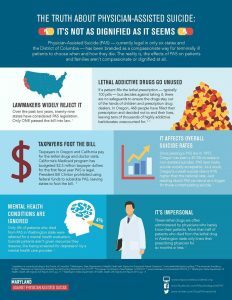 Proponents prefer to redefine the word suicide rather than confront the facts concerning the effects legislation like this has on overall suicide rates or how it runs counter to efforts to prevent suicide generally. As noted, California is spending millions to facilitate some committing suicide while spending tens of millions per year on suicide prevention. We as a culture need to decide whether suicide is an evil to be address or not. Even if you think that you favor this legislation, review the citations in this article and detailed concerns raised. Proponents have not rebutted them in detail and we doubt they will in today’s joint hearing. I urge everyone who opposes this bill to join the Maryland Coalition Against Physician Assisted Suicide, continue to follow up here at Red Maryland and the other voices defending life and educate your friends and neighbors about this important issue.